When I made the decision to turn my blog into a source of full-time income, I had no idea what I was doing. I didn’t know where to look for sponsored posts or how to write them, and on the rare occasion that a brand or media company reached out to ask for a copy of my media kit and rates, my initial reaction was to run in the other direction. I didn’t have a media kit, I had no idea what to charge for my services, and I was terrified my monthly pageviews and social media reach weren’t high enough to work with quality brands. But what I did have was a lot of drive and determination – I didn’t want to go back to my job in corporate marketing! – so rather than crawling into bed with a tub of Ben and Jerry’s, I spent a crazy amount of time researching the ins and outs of how to create a media kit for your blog. It took a lot of upfront work and a little trial and error on my part, but I finally have a solid media kit that sells, and I’ve received countless compliments on my press kit (another fancy term for ‘media kit’) from brands and media companies over the years. Of course, you could skip the hassle of putting together a proper media kit and just slap together an email with your stats and social media reach when pitching to brands and responding to requests for more information about your blog – that’s what I used to do! – but experience has proven to me that a well-crafted media kit is a much more professional way to present yourself and your business to companies you wish to work with. A media kit offers a quick and easy way to summarize all of the key details about your blog, and helps ensure you put your best foot forward each time you communicate to brands and social media companies. 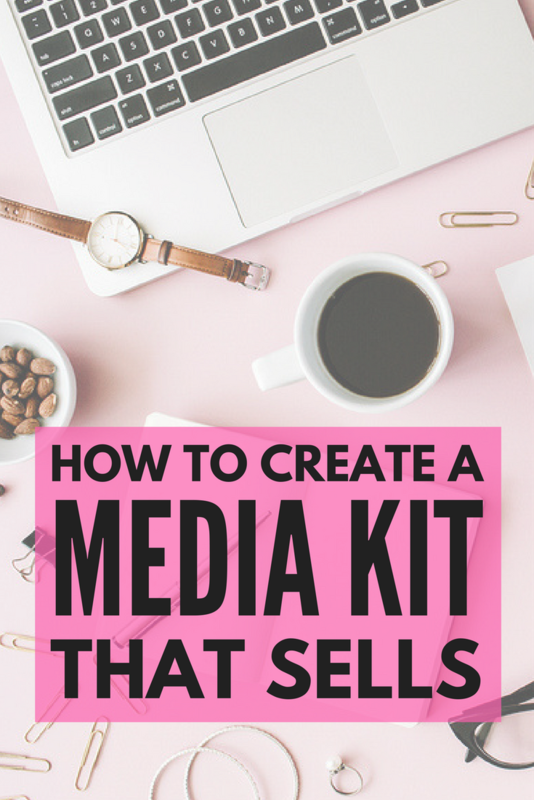 Are you ready to learn how to create a media kit for your blog that sells? Simply put, a media kit is a promotional tool bloggers use to summarize the 5 Ws of their business: the WHAT, WHO, WHEN, WHERE, and WHY of everything they do. Think of it as a tool to sell yourself and your blog to brands you wish to work with by providing a high-level overview of who you are, what you do, and what makes your blog stand out from others. While you can slap together an email with your stats and social media reach when pitching to brands and responding to requests for more information about your blog, a well-crafted media kit is a much more professional way to present yourself and your business to companies you wish to work with. It offers a quick and easy way to summarize all of the key details about your blog, and helps ensure you put your best foot forward each time you communicate with brands and media companies. You can include HEAPS of information in your media kit, but try to keep it as concise as possible. Rather than providing a 10-page autobiography, try to highlight the most important things you want potential partners to know about you and your blog. When I first started blogging, I didn’t post pictures of myself or my family on my blog. It just didn’t feel safe to me, so I used an illustration of myself instead. Did it have a negative impact on my ability to work with brands? I don’t think so. But when I rebranded my site in November 2015 and decided to include an actual head shot of myself, I felt like it allowed me to connect with my readers and sponsors properly. Of course, whether you choose to use a head shot or not is completely up to you, but remember that brands want to work with PEOPLE, and providing a picture of yourself looks more professional and adds credibility. You don’t want to write your entire life history in the bio of your media kit, but you do want to tell your story and sell your personality. Make sure to include the things that set you apart from others within your niche, and include any outstanding skills or expertise you have. Before you get into the nitty, gritty details of your blog, you want to provide a short explanation of what your blog is about and what makes it unique. Think of this as your blog’s Elevator Pitch – a quick summary that defines all of the key features of your business. Once you’ve given a high-level overview of who you are and what your blog is about, you want to provide key stats about your blog – pageviews, unique monthly visitors, etc. – as well as your social media reach. Worried your numbers are too low? Get creative. Highlight the areas where you shine. Maybe your readers stick around on your site for 2+ minutes or read an average of 3 pages each time they pop over to your blog, or maybe you have a ton of Twitter followers you can leverage when promoting sponsored content. Whatever it is, don’t be afraid to boast about it! A great way to get brands to pay attention to your blog is to demonstrate that your readers fall within their target market. Dig deep into your Google Analytics and social media data to get a better sense of who you are talking to. Testimonials from brands and media companies you’ve worked with is a great way to demonstrate your credibility, especially when your reach is small, but if you’re just starting out and don’t have any recommendations you can showcase, don’t be afraid to reach out to your readers to ask if they would be willing to put in a good word for you! When it comes to monetizing your blog, what kind of services would you like to offer? Sponsored posts? Product reviews? Giveaways? Social media promotions? Twitter parties? Speaking engagements? Make sure to include everything you offer so brands know exactly how they can work with you. One fatal mistake I often see bloggers make is that they don’t include their contact information on their blog and/or media kit. The harder you make it for a brand to find your contact details, the less likely it is that they will reach out to you, and since your media kit may very well get separated from your original point of correspondence, it should be highlighted on all of your marketing collateral as well. WHERE CAN YOU YOU FIND MEDIA KIT TEMPLATES? Okay, full disclosure here: while I talk a good game about the importance of having a good media kit – and how to create one – I really struggled when I was putting my own media kit together. I had no problems gathering all of the information I needed, and I’ve always been good at adding a little fluff and making things look good, but when it came to designing something that would look professional and sell, I completely fell short. I needed a pre-defined template with instructions on what to include and where, so I signed up for Blog Clarity’s Media Kit Smash course and I got WAY more out of it than I had hoped. The course includes 8 media kit templates you can easily customize, video demonstrations to help you out, a swipe file showing you exactly how to ask for testimonials, and a BONUS sponsored content pricing worksheet! CLICK HERE for more information about the Media Kit Smash course! If you want to monetize your blog and work with brands, having a killer media kit is key. You can easily create one on your own using the information I’ve shared in this post, but if you struggle with writing a compelling bio, finding reader demographics, knowing what to charge for sponsored content, or designing something that’s sleek and professional, I highly recommend signing up for Blog Clarity’s Media Smash Kit course. With 21 in-depth lessons, you’ll learn how to create a media kit that sells. SIGN-UP FOR MEDIA KIT SMASH TODAY AND SAY HELL YES! TO MONETIZING YOUR BLOG! If you found my eBook helpful in teaching you how to create a media kit for your blog, please share it on Pinterest! And if you’re looking for more blogging tips and tricks, please follow our Blogging board on Pinterest!